Yesterday I went from Anglesey to Bodelwyddan Castle in Denbighshire. Nothing unusual there; I often drive by it, promising myself that I will one day stop to have a closer look, but never managing it. So, I made a special trip out there. As I toured around and looked at the story of its various owners I discovered that the connections between Anglesey and Bodelwyddan run through its history. The original manor house at Bodelwyddan came about because of an eviction. A man with the long genealogical name of Thomas ap Wmffre ap Thomas ap Rhys ap Benet ap Ieuan ap Deikws ap Ieuan Ddu ap Trahaiarn was the owner of Henllys, near Beaumaris. But, Edward IV decided that it was ideal for his Deputy Governor of Beaumaris Castle, so poor Thomas was dispossessed of it. He was given the land at Bodelwyddan instead, where he built a manor house around 1460. He also decided at the time to take the family surname of Humphreys (from his father’s name, Wmffre). The house and lands remained with the Humphreys family for 230 years until it was purchased by Sir William Williams, who was Speaker in the House of Commons from 1680–1681. Sir William was also an Anglesey boy, son of Hugh Williams, rector of Llantrisant and Llanrhuddlad parish. A fine memorial to Hugh can be found in his old parish church of Llantrisant. William became a lawyer, after attending Jesus College, Oxford, and Gray’s Inn. He later entered politics, become MP, first for Chester, then Beaumaris. He purchased Bodelwyddan for the use of his son, but it was never the family’s main residence until Sir William’s great-great grandson John was made a baronet in 1798. He decided that the simple 15th century manor house wasn’t fitting for a man of his stature, and commenced extending and altering the building in the Greek Revival style. His son continued the work, adding Gothic Style towers to give it its current castle-like appearance. Throughout the house the family’s crest of the cross foxes appears in tiles, ceiling bosses and stained glass windows. The same crest can be seen in their ancestor Rev. 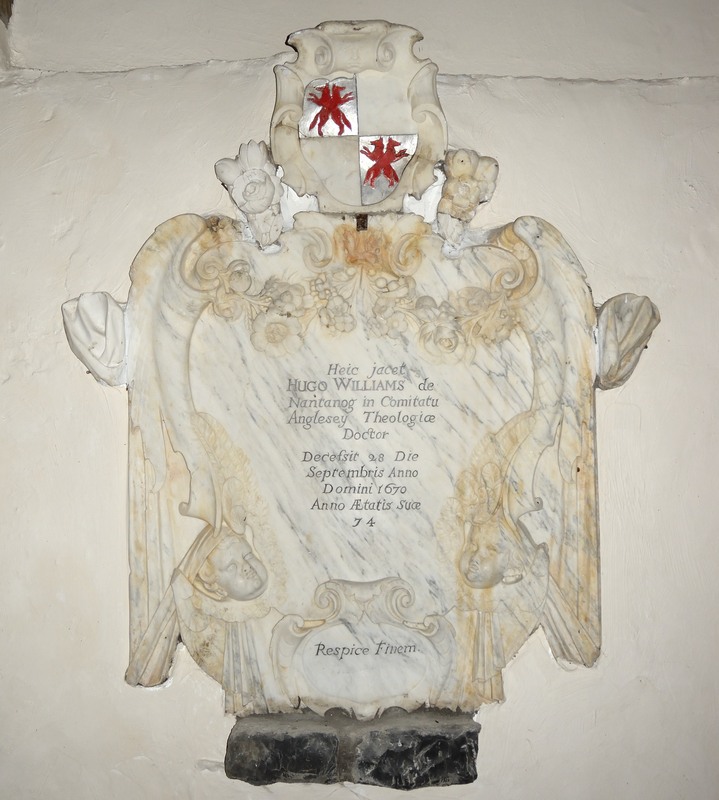 Hugh’s memorial at Llantrisant Church (see picture above). Sir John, the 1st Baronet of Bodelwyddan, also has two other Anglesey connections. He married Margaret Williams, the heiress of the Ty Fry estate near Pentraeth. His parents had given him land near Beaumaris, which was passed on to his son, Sir John Hay Williams. As a gift to his wife, Lady Sarah, he began building a fairy-tale style castle overlooking the Menai Strait. This building is now the luxury hotel, Chateau Rhianfa, situated on the Menai Bridge to Beaumaris road. During the First World War the house was taken over to be a recuperation hospital for wounded soldiers, associated with the nearby Kinmel training camp. After that it was leased to Lowther College girl’s school, until 1982. It was then bought by Clwyd County Council to develop as a visitor attraction, with part of the site converted to a luxury hotel. Until recently it served as home to a large number of paintings from the National Portrait Gallery, but now the walls are full of the Bodelwyddan Castle Trust’s own collections of Welsh art, including an excellent Snowdonia landscape by another Anglesey boy, Kyffin Williams. I believe there is a connection to the Parciau estate in Marianglas. I think it is that the current Sir Laurence Williams’ mother was one of the daughters of the last family to live in Bodelwyddan Castle. Thanks for that. I’ve just done a quick search and found a biography in the Archives Wales site that confirms his second wife was the daughter of the 4th baronet. His two sons from an earlier marriage somehow succeeded to the title, too!